The International Motor Sports Association (IMSA) is a North American various auto racing sanctioning body based in Daytona Beach, Florida under the jurisdiction of the ACCUS arm of the FIA. It was started by John Bishop, a former executive director of SCCA (Sports Car Club of America), and his wife Peggy in 1969 with help from Bill France, Sr. of NASCAR. Beginning in 2014, IMSA is the sanctioning body of the WeatherTech SportsCar Championship, the premier series resulting from the merger of Grand-Am Road Racing and the American Le Mans Series presented by Tequila Patrón. John Bishop, a Sikorsky employee, first became involved in motorsport in the 1950s when he met Dave Allen, a Sports Car Club of America (SCCA) staff member. Allen offered Bishop a management position on the SCCA Contest Board, which Bishop quickly accepted. Bishop moved to Westport, Connecticut shortly thereafter. Bishop's duties consisted of defining technical rules and general administration of SCCA competition, as well as providing artwork for many of the club's magazines and event programmes. He became well known in the motorsport scene and enjoyed a good relationship with the organization's president and Kimberly-Clark heir, James H. Kimberly. In 1958, things changed for Bishop as the SCCA experienced internal changes. A new executive director position was created, to which each regional executive reported. This position was taken by Hugo Rush, who later became instrumental in Allen's departure. Although Bishop's relationship with Rush was not good, Bishop gained a vast amount of experience and began to show his qualities as a manager. Rush would later depart due to his disagreement with the club as it moved to promote professional motor sports. Bishop took his place as executive director and was now responsible for both amateur and professional programs. To ensure a more serious level of competition, he was tasked with rewriting the technical rules for the newly formed Pro Racing program. The SCCA had now taken the big step up to professional racing. By 1962, the SCCA was tasked with managing major World Championship for Makes rounds, particularly at Daytona, Sebring, Bridgehampton and Watkins Glen. The club was also involved in the US Grand Prix. Bishop helped to create the USRRC (United States Road Racing Championship) series for Group 7 sports cars to recover races that had been taken by rival United States Automobile Club (USAC). Bishop was also instrumental in founding the SCCA Trans-Am series and the SCCA/CASC Can-Am series. In 1969, the tension and in-fighting caused Bishop to resign. Bill France, Sr. was instrumental in the creation of the International Motor Sports Association. France founded NASCAR as a professional oval track series and wanted to do the same for road racing. After discussions with Bishop, IMSA was born and Bishop was given the sole control of the organization (like NASCAR, there was no board of directors). France financed the majority of the organization and owned 75% of the stock; Bishop owned the remaining 25%. The first race to be organized by IMSA was a Formula Vee and Formula Ford event at Pocono Raceway in October 1969. The SCCA threatened the circuit management and asked them to block IMSA from racing there. The event was held, although IMSA had to pay an additional $10,000 in rental fees. The race had an attendance of 328 spectators. The organization soldiered on despite the small crowds, and another ten races were planned. Bill France, suffering from financial setbacks, brought on new investors to take over part of his stake in the series. By the end of the 1970 season, Bishop realized that single-seaters were not capable of attracting large crowds. So he helped to establish the foundations of the FIA (Fédération Internationale de l'Automobile) "J appendix" for World Championship for Makes sports cars. For the end of the 1970 season, he advertised a new championship for Group 2 and Group 4 cars with equity between competitors. The 1971 Grand Touring (GT) season introduced international endurance racing to North America. In 1972, Camel Cigarettes became the new sponsor of the GT series and the sedan series became known as the B.F. Goodrich Radial Challenge. By 1973, the organization gained recognition from the FIA and became the sanctioning body of the 12 Hours of Sebring for the first time. Bishop did not believe that factory teams would stick with the new series, so he tried to ensure that the rules were not biased in their favor. He was in favor of looking after privateer teams and helping them to become competitive. As European cars began to dominate, a new series was formed in 1975 called All American Grand Touring (AAGT) to give equal latitude to foreign cars. Turbocharged cars were permitted in 1977. In the same year, Bishop invited a pair of Jean Rondeau-built Inaltera's to compete as "special prototypes". They became the foundation of the newly formed Grand Touring Prototype (GTP) category in 1981, with separate rules similar to Group C (Bishop was unhappy with the fuel consumption formula of the latter). In 1984, Fédération Internationale du Sport Automobile (FISA), the organizers of the World Endurance Championship (WEC), attempted to unite the two organizations by scrapping the existing formula and adopting IMSA rules. This did not please Porsche, which was spending vast sums of money on engine development at the time. Porsche responded by boycotting the 24 Hours of Le Mans of that year. FISA responded by abandoning the rule change for the time being. In 1987, FISA president Jean-Marie Balestre almost made a successful attempt to settle the dispute by announcing that turbochargers and fuel restrictions would be phased out by 1989 (excepting naturally aspirated engines below 3.5 liters). This attempt failed, as did another in 1991, in which with chassis ballast penalties for turbocharged cars rendered them uncompetitive, except at Le Mans. IMSA continued to have success with its own Camel GT series. In 1987, John Bishop had to undergo a heart bypass surgery, forcing him to rethink his priorities. He began to realise that the Camel GT series was in danger of becoming oriented toward the factory-backed teams and less to the privateers as Bishop originally intended. Rules were modified to accommodate the factory teams, which wanted to get into the series, despite Bishop's belief that such changes would be unfavorable to the series in the long run, especially if they failed to meet their objectives. In January 1989, the Bishops sold the company to Mike Cone and Jeff Parker, owners of the IMSA Grand Prix of St. Petersburg. Bishop shortly stepped down as the organisation's president in favor of Mark Raffauf, his deputy president and the organisation's representative on the ACCUS (Automobile Competition Committee for the United States), an FIA recognised sporting body. Cone and Parker in turn sold the organization to businessman Charles Slater by the early 1990s. In 1996 Slater sold the organization with previously accumulated debt to Roberto Muller (ex-CEO of Reebok) and Wall Street based portfolio manager for Bill Gates, Andy Evans, who also was an IndyCar owner and owner/driver of the Scandia World Sports Car team. These changes would lead to the departure of many of the executive board members. Evans was responsible for the name change to Professional Sports Car Racing (PSCR). In 1998 the United States Road Racing Championship was revived as an alternative to Professional Sports Car Racing, involving the Sports Car Club of America and headed by a group of competitors and ex-IMSA personnel, including John Bishop, Bill France Jr., Rob Dyson, Roger Penske, Skip Barber, and Ralph Sanchez. They wanted to keep rules within the United States. When this initially failed, as a result Don Panoz and Barber departed to affiliate themselves with PSCR. In the spring of 1998, Don Panoz created a partnership with the Automobile Club de L'Ouest (ACO), the organizers of the 24 Hours of Le Mans, to begin a 10-hour race in the spirit of Le Mans, dubbed the Petit Le Mans to be held at Panoz's Road Atlanta facility. After the success of the inaugural Petit Le Mans as a part of the 1998 Professional SportsCar Racing Championship season, Panoz announced a new full season championship for 1999, to be known as the American Le Mans Series (ALMS) which adopted the ACO's rulebook under PSCR sanction. The new series replaced the Professional Sports Car Racing championship as PSCR's headline series. Under tremendous pressure from team owners and management, Evans sold Professional Sports Car Racing to Don Panoz in 2001, to solidify the American Le Mans Series. Don Panoz renamed the sanctioning organization back to the International Motor Sports Association and was the official sanctioning body of the ALMS, as well as its support series, the Prototype Lites, the Star Mazda series, GT3 Cup Challenge and the Panoz GT Pro series. After the 1999 USRRC season was cancelled halfway through its schedule due to a lack of competitors, a second attempt at a new sports car sanction body known as the Grand American Road Racing Association was created with full support of NASCAR's France family and other motorsports notables and had its inaugural season in 2000. Grand-Am struggled early on, but proved to be a formidable competitor to the ALMS in later years with a different philosophy based on lower-tech cars, most notably its prototype category Daytona Prototype, giving larger fields and closer competition. Much like the split between Champ Car and the IRL, this split was seen by many as being detrimental to the sport as a whole. Attendance, sponsorships and media coverage dropped dramatically after the split in 1998. In 2012, Don Panoz sold the Braselton, Georgia-based ALMS to Grand-Am Road Racing and helped organize a merger between the ALMS and the Rolex Sports Car Series. In 2013 the unified series was announced as the Tudor United SportsCar Championship. The announcement also confirmed that IMSA will manage and sanction the new series. These are the series that are currently sanctioned and managed by the IMSA organization. The WeatherTech SportsCar Championship began in 2014 and is the premier sports car series resulting from the merger of Grand-Am Road Racing and the American Le Mans Series. Featuring some of the greatest drivers in the world and the most historic venues in North America, the Tudor United SportsCar Championship debuted January 25–26, 2014 at Daytona International Speedway. For the 2016 season title sponsorship changed from Tudor to WeatherTech. The IMSA Michelin Pilot Challenge is a grand touring and touring car racing series run by the International Motor Sports Association. The Continental Tire Sports Car Challenge was the support series for GRAND-AM's premier offering, the Rolex Sports Car Series. In 2014 it became the support series for the United SportsCar Championship series upon the merger of the Rolex Series and the American Le Mans Series. The series is now branded as the IMSA Continental Tire SportsCar Challenge, with Continental Tire having been title sponsor since the 2010 season until 2018. In 2019 Michelin will be replacing Continental Tire as supplier and title sponsor. The Mazda Prototype Lites presented by Cooper Tires Championship is a series featuring two classes of single-seat prototype cars racing simultaneously. Most races are held in support of the United SportsCar Championship; prior to 2014 it was the support series for the American Le Mans Series. The L1 class features Élan Motorsport Technologies DP02 cars powered by a Mazda MP2 engine, and L2 consists of West Racing WX10 and WR1000 chassis with either a Kawasaki ZX-10R or Suzuki GSX-R1000 engine. Each class has an overall championship, a master's championship for drivers at least 40 years of age, and a team championship. In 2017 the series became the IMSA Prototype Challenge presented by Mazda, featuring LMP3 cars and L1 cars re-branded as MPC (Mazda Prototype Challenge). The Porsche GT3 Cup Challenge USA by Yokohama is a one-make series dedicated to the Porsche 911 GT3, similar in concept to the Porsche Carrera Cup, held since 2005. Drivers are allowed to race in two different classes, Platinum and Gold. The entries were allowed in the American Le Mans Series starting in 2009, in the GTC Class. In 2011, IMSA created the Ultra 94 Porsche Cup Challenge Canada by Yokohama, which races in support of major Canadian motorsports events including, the Formula One Canadian Grand Prix, the Honda Indy Toronto, the Grand Prix of Mosport and the Grand Prix de Trois-Rivières. The Ferrari Challenge is a one-make series dedicated currently to the Ferrari 458 Italia, which was previously sanctioned by Grand-Am prior to the merger. The Lamborghini Super Trofeo is a one-make series dedicated currently to multi-class racing, showcasing both the new Huracán LP 620-2 Super Trofeo and the Gallardo LP 570-4 Super Trofeo that was the exclusive car for the first two seasons of the North America championship in 2013 and 2014. The series debuted in North America under IMSA sanction in 2013. These are the series that were formerly run by the IMSA organization. The International Sedan Series was short-lived and the genesis of the Radial Sedan Series. It is unclear if the 1969 inaugural IMSA Sedan race held at the Talladega Superspeedway Road Course was designated International Sedan Series or not. That being the only race held in 1969 details are sketchy, but over the winter of 1969–70 rules were officially promulgated for this Series. It was initially to be known as the International 100 Series as it was intended for sedans up to 100 c.i or 1600 cc., however was revised prior to the start of the 1970 season to include larger engines and presumably the name change to International Sedan Series. The next year, 1971, the Series was revamped and became the Radial Sedan Series with the revolutionary innovation of requiring DOT radial tires. New rules allowed for cars over 1.6 L divided between two classes. Class A was for Sedans under 2 L., except for overhead cam engines which were limited to 1.6 L. Class B was for larger engines up to whatever IMSA decided appropriate for the Class which was the AMC Gremlin's 232 c.i. for the duration of the 'original' RS Series. As an aside, the "Baby Grand" moniker frequently applied to these IMSA Series was just that, a nickname. Around this same time a series that was officially designated Baby Grand was sanctioned by NASCAR and consisted of 4-cylinder cars purpose-built to run NASCAR ovals. A few RS regulars are known to have run both Series with the same car making minimal changes to accommodate the difference in rules. Carson Baird, driving a Dodge Colt, was one of these 'crossover' competitors. The IMSA RS Series (abbreviation for Radial Sedan) began as the Baby Grand Series, in 1971. Originally sponsored by B.F. Goodrich (therefore known as Goodrich Radial Challenge) until they dropped sponsorship midway through 1975 (or 1976) and then by Goodyear (becoming the Goodyear Radial Challenge), and later as Champion Spark Plug Challenge. The initial race held was in 1969 at Talladega Superspeedway Road Course. Gaston Andrey was first overall in an Alfa Romeo Giulia Super sedan. The Series' first year was actually 1970 with only two races, the inaugural race was at the newly constructed Summit Point Motorsports Park on Memorial Day weekend; Rasey Feezell was first overall in an Alfa Romeo Giulia TI Super sedan; the second race was held at the Montgomery Speedway, Alabama, Red Farmer won in a specially prepared Datsun 510. Feezell didn't fare too well having to drive against the local four-cylinder "beater class" cars brought in to fill out the field, with their protruding wheels rubbing Racey's "immaculate" Alfa Romeo. Infuriated, Feezell quit and never ran another IMSA RS race after that. The idea was to attract racers who did not have the budgets that were required in the GT category as well as an emphasis on compact sedans such as the AMC Gremlin and the Opel Manta. There were two classes from 1970 through 1973: Class A for under two liters and under 1.6 liters with overhead cam and Class B for over 1.6 L with overhead cam and over two liters up to the largest permitted engine being the 232 cubic inches (3.80 l) AMC Gremlin. In 1974 all cars were placed in one class, with the only parity for the smaller engines being free carburetion for under 1.6 liters. Limited preparation was permitted, and since the entrants were meant to be street-driven race cars, the original rules required the retention of headlights, seats, upholstery, window cranks, stock brakes and original springs and radial tires. Only the exhaust systems and shock absorbers were free. Later rules regarding headlights, seats, upholstery, window cranks, original springs, and other stock elements were loosened up somewhat. From the beginning, engine modifications similar to Sports Car Club of America B Sedan were permitted, with the main difference being that over-boring cylinders was not allowed, and stock carburetors being required, but modifications allowed. In addition, springs and alignment were free. The series was loosely based on rival SCCA Trans-Am's Two-Five Challenge rules. The series became dominated mostly by Mazda's rotary-powered RX-2 and RX-3 prompting IMSA to specify heavier weights than piston-engined cars and prohibited any modifications to the rotors and more importantly to intake and exhaust ports. Datsun also had a fair share of success within the series with cars such as the 510 and 200SX. Many drivers would cut their teeth in this series such as Don Devendorf, of Electramotive fame, Jim Downing, of Kudzu, and Bobby Rahal. The final season was run in 1984 before it was replaced by the IMSA Showroom Stock class the following year, while retaining its sponsor until 1988. As with most now-defunct racing classes, there are revival races run for this category and the SCCA sanctions events for mostly-stock and all-stock cars. The American Challenge (in full, Kelly American Challenge), otherwise abbreviated as AAC was a category for US-built cars and throughout the series, it was always run as a support race to the premier GT series. Starting in 1977, the series ran until 1989. In 1992, the premier GTO category was renamed to GTS due to sponsor reasons, and rather than leaving the GTO category redundant, the title was reallocated to the former American Challenge cars. As a result, they would be run alongside GTS cars. This series started the careers of Irv Hoerr, Kenny Irwin, Jr., Patty Moise, Clay Young, Lyn St. James and Paul Gentilozzi. The Renault Cup was a one-make racing series that ran between 1982 and 1985. There was an East Coast (1982–1985) and West Coast series (1983–1985) as well as an overall championship. The series began with the Renault Le Car for two seasons on the East Coast until the its discontinuation in the US. The last two seasons, the East Coast Series ran the Renault Encore. The West Coast Series started after the first successful year on the East Coast, but ran the Renault Alliance which had just been introduced. The genesis of the series was an association of drivers, Associated Road Racers (ARR), founded by Steve Coleman of Raleigh, North Carolina. The association's objective was to start an inexpensive but competitive series with large car counts. The main prerequisite requirement was a series that would allow drivers who had regular jobs and a life to compete with at least a chance to win the championship without having to travel coast to coast, as was the case with other similar series such as the VW Bilstein Cup. The preference was to have a roughly ten-race schedule, with each driver's best six finishes counting toward the Championship. ARR's members were mostly Showroom Stock racers from the Southeast and Northeast Sports Car Club of America (SCCA) regions. All members put up a bond to ensure they would participate if it came to fruition so that a sanctioning body and a sponsor would be assured success from the start. In the beginning an outline of series rules was drawn up to attract like-minded drivers to join in the effort. Once the association was formed, a final version was to be drafted with all the members' input. The rules along with the association's proposed plan to organize and launch the series, were sent to several manufacturers soliciting sponsorship, including Mazda, Toyota, Nissan, and Renault. All except Renault either rejected the proposal or did not respond. Renault not only responded, it jumped at the chance, since it was quite familiar with the concept of a one-make series. ARR and Renault negotiated to finalize a format competing with the Le Car R5. Due to classic concerns of track owners and sanctioning bodies, Renault was reluctant to agree to the drivers' points system. Their counterproposal was to run an East Coast series in lieu of nationwide. Since most of the interested drivers were from the East Coast, and the amount of travel required was somewhat limited, this was accepted by the drivers. Once Renault was on board, John Bishop, President of IMSA, was approached to sanction the series. He was very skeptical at first. A meeting was held on April 4, 1981 at Road Atlanta between Bishop, B Clar, the US Competition Director of Renault, and Coleman representing the drivers. Renault offered a major support program and ARR would guarantee a minimum of twenty-five entrants for the first race. Bishop, still skeptical, agreed to sanction the series. Coleman even suggested there might be as many as fifty, if Renault and IMSA didn't revise the proposed series rules to a point the majority of drivers would pull out before then. Still skeptical he agreed, convinced by Renault's commitment and the driver's assurances of a full field for the inaugural race. Exactly one year to the date on April 4, 1982, the inaugural race was held at Road Atlanta. 51 Le Cars started the race. One notable driver to come from the series was Parker Johnstone; he took runner-up spot on his debut season in 1984 and would virtually dominate the series following that. In 1985, IMSA would undergo a major rules reformat while still retaining its sponsor, therefore it was still known by its sponsor's moniker. This time, the series was more restricted to current models, that is to say models then currently available for retail sale in dealerships throughout the US. Other than that, the series had rules and race formats that were similar to the RS series, being an endurance series. At the end of the 1987 season, Champion stepped down as sponsor and was replaced by Firestone Tire and Rubber Company; therefore, the series was renamed IMSA Firestone Firehawk Endurance Championship, commonly known as the Firehawk Series, after the Firehawk performance tire brand. Total prize purses, year-end point funds and manufacturer contingency awards in 1991 amounted up to $1 million. As required by the sponsor, all cars were required to use its own Firehawk SZ or Firehawk SV tires which could be shaved to racing depth, or the all-season Firehawk GTX. Bosch and Kendall Oil were also associate sponsors. Most of the drivers that competed in the series were amateurs or semi-professional, whilst a few made their living out of competing in the series. Dorsey Schroeder and John Andretti are among the few full-time professional drivers who cut their teeth in the series. Meetings usually attracted over ninety entries and were often televised, the duration of the races varying from one two hour and a half event to one 24 hour race. The series would soldier on until 1998, by then known as Speedvision Cup, named for the former motosports-ortiented television network. 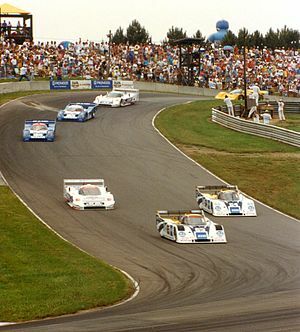 During the sportscar racing "split" from 1998 until 2013, a rival series from Canada, the Motorola Cup, was sanctioned by the SCCA, with Grand-Am taking over in 2001. This is the other series that led to the modern Continental Tire Sports Car Challenge. IMSA also hosted the Bridgestone Supercar Championship, sponsored by the sister brand of Firestone, Bridgestone, which was for medium to higher end sports cars such as the Chevrolet Corvette, Porsche 911 Turbo, Mazda RX-7, Nissan 300ZX and Lotus Esprit and was run between 1991 up until 1995. Usually a support race to the GT races, running at 30 minutes, which were televised, the series attracted some older, well-known professional drivers such as Hans-Joachim Stuck, Hurley Haywood, Elliot Forbes-Robinson and Paul Newman. with a total prize fund of $555,555 for the 1992 season. All cars had to run on roadgoing Bridgestone Potenza RE71 tires which were trimmed to semi-racing depth and during a wet race, cars raced on full depth. The series was not without controversy, mainly for the all-composite Consulier GTP, as it was bordering on a departure from the showroom stock ethos, as well as being criticised for having little common with cars that the general public ever saw on a public road. The GTP debuted with just four silver Consulier Series II GTP at Lime Rock in 1991, despite having a 2.2 liter turbo with about 195 hp (145 kW) connected to a five-speed gearbox, weighing at 2,100 lb (950 kg). The car took a pole-to-chequered flag finish, easily outpacing the other more powerful but heavier cars, even if they were piloted by talented and more experienced drivers such as Hurley Haywood in a factory Porsche, Boris Said's Callaway Twin Turbo Corvette, and Jim Minnaker in a factory ZR1 Corvette. It was subsequently announced by IMSA that they felt that it was not in the best interests of the series to allow the Consulier to continue with such a massive weight advantage, so as a result they added a 300 lb (140 kg) weight penalty to the GTP,before its being barred from the series altogether at the end of the season, despite taking a runner up spot. The Formula BMW USA series is the North American version of the open-wheel series supported by BMW. All running identical chassis powered by BMW motorcycle engines, the series serves as stepping stone for formula car drivers moving into higher international series. A world championship of all Formula BMW series is run at the end of the year, taking the top drivers from Formula BMW USA and the other similar series elsewhere in the world. In June 2008, IMSA began sanction of the Atlantic Championship for two seasons. The series later came under SCCA Pro Racing sanction in 2012. Originally began as Women's Global GT Series, formed by Lyn St. James in 1999, the series began as a support race to ALMS for women racers, using the race modified version of the Panoz Esperante series of cars. The series was an invitational affair with forty one drivers are selected out of four hundred applicants to participate in the Women’s Global GT Series. The grid would usually consists of experienced racers such as former Formula One drivers, Giovanna Amati and Divina Galica, NASCAR's Shawna Robinson, and Italian Audi factory team touring car driver Tamara Vidali against talented amateur drivers from varying degrees of professions, such as radio personality, police officer, law student, and racing simulations art designer for Microsoft. ^ "IMSA". IMSA. Archived from the original on 2017-07-04. Retrieved 2 July 2017. ^ a b c d e f "IMSAblog: A tribute to John Bishop". 23 April 2006. Archived from the original on 2011-07-24. Retrieved 21 January 2008. ^ a b c Martin, J. A.; Wells, Ken (January 2001). Prototypes: The History of the IMSA GTP Series (1st ed.). United States: David Bull Publishing. pp. 13–14. ISBN 1-893618-01-3. ^ By. "James Kimberly, Kleenex heir, dies". Archived from the original on 2014-12-01. Retrieved 2 July 2017. ^ "IMSAblog: Do you want to know about GT racing in the 70s". January 2006. Archived from the original on 2011-09-30. Retrieved 21 January 2008. ^ "IMSA GT 1991 season". WSRP. Archived from the original on 2008-09-22. Retrieved 2014-06-23. ^ "Racing Sports Cars". Racing Sports Cars. 1991-02-06. Archived from the original on 2016-03-03. Retrieved 2014-06-23. ^ a b c d e Briggs, Ian (1991). Endurance Racing 1981–1991 (1st ed.). United Kingdom: Osprey Automotive. pp. 24&21. ISBN 1-85532-228-5. ^ a b "IMSA wheels some of its people to NY, Indy dmyauthor=". Tampa Bay Business Journal. January 20, 1997. Archived from the original on 2010-12-09. Retrieved 2008-01-21. ^ a b c Smotherman, Mark (24 June 2007). "Selected Sports Car Racing History:1997 shakeup in US". Archived from the original on 2008-10-13. Retrieved 21 January 2008. ^ "Prototype Lites: 2011 Season Preview". eSportsRacer.com. 11 March 2011. Archived from the original on 30 June 2011. Retrieved 30 June 2011. ^ "IMSA International Sedan race". www.ultimateracinghistory.com. Archived from the original on 2016-03-04. Retrieved 2 July 2017. ^ "Autodelta Ti Super - Alfa Romeo Bulletin Board & Forums". www.alfabb.com. Archived from the original on 2017-05-10. Retrieved 2 July 2017. ^ "The history of the Trans-AM 2.5 Challenge". www.bsedan.com. Archived from the original on February 24, 2014. ^ "Grassroots Motorsports » Potent Pintos: These Drivers Have No Worries About Being Hit from Behind". Archived from the original on 2007-02-21. Retrieved 2 July 2017. ^ "Mazda Motorsports – Mazda Motorsports Development". www.mazdausa.com. Archived from the original on 2016-03-04. Retrieved 2 July 2017. ^ "1987 Champion Spark Plug Challenge Mid-Ohio by Mark Windecker". PBase. Archived from the original on 2017-06-16. Retrieved 2 July 2017. ^ "AIM". members.aol.com. Archived from the original on 2007-03-18. Retrieved 2 July 2017. ^ "Page D-1". 15 January 2014. Archived from the original on 2016-09-12. Retrieved 2 July 2017. ^ "Parker Johnstone - A Sponsors Dream Driver". Archived from the original on 2007-10-22. Retrieved 2 July 2017. ^ "INDYLIGHTS: Parker Johnstone Teams With Dorricott Racing". www.theautochannel.com. Archived from the original on 2016-03-03. Retrieved 2 July 2017. ^ a b c McKnight, Nigel (1991). Showroom Stock Race Car Preparation (1st ed.). Motorbooks. ISBN 0-87938-652-5. ^ "International Motor Sport Association". Retrieved 2 July 2017. ^ a b "Giovanna Amati - Biography". Archived from the original on 25 July 2008. Retrieved 2 July 2017. ^ "A Sporting Life page 2". Archived from the original on 2007-08-13. Retrieved 2 July 2017.